Do you have the balls to be fertile? Taking responsibility for your health requires loads of courage. When something’s not right with your health, your body is sending a signal. It’s talking to you loud and clear. The problem is, you may not be listening. And you may not have been listening for a long time. A ton of emotional baggage ends up stored in our reproductive organs and possibly wreaking havoc on our fertility. Oftentimes emotional health is the missing key to pregnancy success! So why aren't you listening to your body? Because you’re scared! We all are! We’re scared of facing what our bodies have to tell us. Because if we face it, that means we have TO DO something about it! And it’s just seems a whole lot easier staying in our old familiar comfortable ways. But you should really be most scared of AVOIDING this message. Of NOT listening. That is what is causing more pain and dysfunction in your life and your health than anything because that baggage doesn’t just go away. It festers. And more than anything, it’s crampin’ your style. It’s like choosing to live in a cage with a wide open door. Whatever emotions you’re avoiding are unconsciously controlling your choices. And quite possibly controlling your fertility. Avoidance is probably why you’re overworking, under sleeping, anxious, depressed, making bad food choices, feeling alone and isolated, in unhealthy relationships, in a job you hate, drinking too much, spending too much, people pleasing, etc., etc., etc. Whatever your escape method may be. 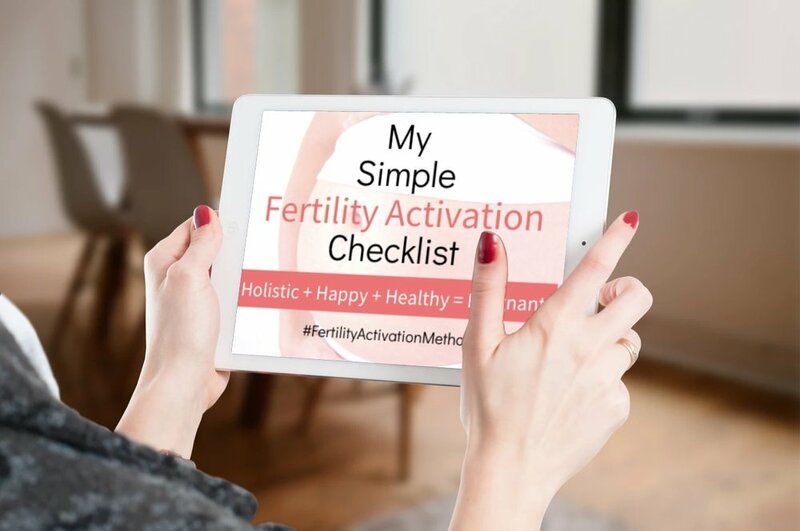 All these choices factor into your fertile health in a major way. Even the familiarity of a “disease” can start feeling comfortable, as much as it stinks. Have you ever had that experience where you were in a bad relationship, but you just couldn’t get out of it because, although miserable, it was comfortable and familiar? I’ve certainly had more of those than I care to admit. I knew the longer it took for me to work up the courage to get out the relationship, the more misery I was putting myself through. That certainly wasn’t good for my mental or physical health. Don’t be fooled. Comfortable may seem safe. But the truth is, comfortable is DANGEROUS! Whether it’s baby steps or Grand Canyon leaps, the point is… TO MOVE. Choose to move towards awareness and conscious living. Choose to take control of your WHOLE health, including your body, your emotions, your mind and your spirit. How do you know if your emotional baggage may be affecting your fertility? Not everyone can face her junk head on. It’s takes major brass ovaries. It’s really hard work. It’s the work of a Princess Warrior. BUT the advantage is that it’s really efficient. And when you’re trying to get pregnant and you hear that annoying ‘biological clock’ ticking, you may be more motivated to take giant leaps rather than baby ones. The bonus is, the bigger the leap, the bigger the rewards! The ayahuasca and Amazon shaman plant medicine is the most efficient medicine that I’ve discovered for making these huge leaps. And I’ve experienced A LOT of different holistic medicines from around the world. You name it, I’ve tried it. Which is why I think it’s such a great option for women struggling to conceive who don’t want to waste time. Since my own experience with the Amazon plant medicine, my life has completely changed at lightening speed. I uncovered a childhood wound that I didn’t even know was there but clearly explained many of my problems, problems that have affected my physical and emotional health. It’s been really hard work, I’m not gonna lie. I’ve had to follow through and walk the walk since then. I’ve had to create healthy boundaries, something I’ve always struggled with. I continue to closely examine and take responsibility for my choices on a daily basis. Everyday I choose to move forward and choose NOT to fall back into playing it safe and comfortable. As a result, I am completely recreating my life! I’m creating a new sense of family, purpose, health of my body and mind, a healthier relationship with my son, and a deeper connection to my higher self. I’m enjoying more authentic relationships. I’m not living how I think OTHER people want me to live. I’m not living to please others. I’m living MY life the way I want to. Oh, and the icing on the cake is that my periods are more regular, which is a sign that I’m more fertile. I challenge you to leap not just for the longing to grow your family, but for the longing to live a more amazing and FREE life! Free from guilt, shame, sorrow, loneliness, apathy and self-doubt. You can live your life full of confidence, power, love and joy! You can make the decisions to live the life your DREAM of living. Discover that what you think isn’t possible, truly is possible! This is the path to whole health and true freedom. Is yoga, visualization or nutrition sabotaging my pregnancy success?